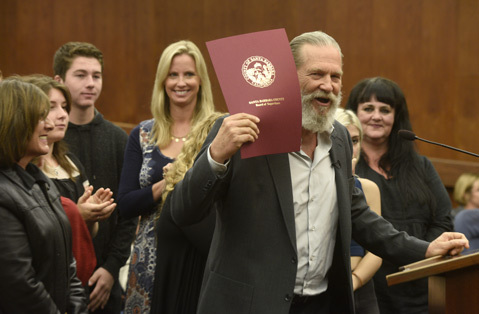 Jeff Bridges (pictured), actor and Montecito resident, infused the Board of Supervisors meeting on 12/8 with a splash of Hollywood celebrity, showing up to receive a commendation for his work feeding hungry public school kids. The No Kid Hungry program that Bridges promotes served 211,874 meals this past summer compared to 159,231 the summer before, a 33 percent increase. In that same time, the program ​— ​which targets students who receive free or reduced-cost meals ​— ​expanded the number of sites from 33 to 40. Joining Bridges at the podium were about 20 people involved in the program. Many were partners affiliated with the Foodbank, school districts, or the Community Action Commission; others were teenage musicians who performed at this summer’s opening No Kid Hungry event held at Bohnett Park.